Dr. Jig Patel, dentist in Schaumburg, IL, achieves Diplomate status of the International Dental Implant Association and was given this award during the 2018 Chicago Summer Symposium. Dr. Patel has now attained the highest membership level of the IDIA, an achievement accomplished by less than one percent of dentists in the world. Dr. Jig Patel was recently awarded Diplomate status of the International Dental Implant Association (IDIA) at the 13th annual Summer Symposium in Chicago, IL. After already achieving Fellow and Master status, Dr. Patel has now attained the highest membership level of the IDIA, an achievement accomplished by less than one percent of dentists in the world. Dr. Patel practices as a trusted dentist in Schaumburg, IL, who takes pride in offering lasting dental implants to improve patients’ oral health and confidence. Lead by renowned lecturer and oral surgeon, Dr. Arun Garg, the IDIA is one of the largest professional networking organization in the world with the sole purpose of educating clinicians on the latest in dental implants. Founded by Dr. Garg in 2008, the IDIA has grown to almost 3,000 members since, each trained by Implant Seminars in modern implant dentistry. After establishing their position in the organization and taking numerous continuing education courses approved by the Academy of General Dentistry, members have the opportunity to achieve Fellow, Master, and eventually, Diplomate status. 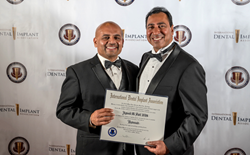 Dr. Patel is honored to be awarded as a Diplomate of the IDIA and applies his extensive training in implant dentistry as a dentist in Schaumburg, IL. Dental implants are the leading tooth replacement solution that can renew a smile, restore function and last a lifetime with proper placement and regular hygiene visits. Dr. Patel offers a full array of dental implant services including tooth extractions and bone grafting before dental implants, precise implant placement and custom CEREC crowns and bridges to finish the procedure. Dental implants can even be part of a full mouth reconstruction allowing patients to transform their smiles under just one treatment plan. Call 847-348-8673 to receive a custom dental implants consultation by a skilled dentist in Schaumburg, IL and Diplomate of the IDIA. To learn more about Dr. Patel, his accomplished credentials or his private practice, Schaumburg Dental Studio, visit his website at http://www.SchaumburgDentalStudio.com.